With “The New Youth” I want to popularize the image of girls going to school in rural India. To demonstrate this I combined the use of the rules of propaganda imagery and youth advertisement. The young schoolgirl is showing her schoolbook to the world, proud and self-confident, looking into her own bright future. With the strength she sends out in this image, she knows, she will overcome all the struggles ahead and reach any goal she can imagine, anything is possible. 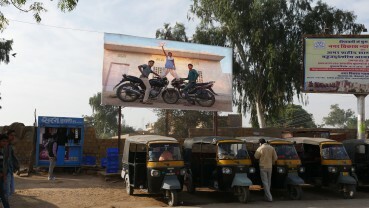 In another picture the girl stands on two motorbikes. She is demonstrating a position of power, unusual for a woman in India, being supported by two men. This stance brings to mind a human pyramid as seen in a circus. The boys on the motorbikes, in contrast to the girl, are looking at us directly. With their pose on the motorbikes and their forthright gaze, without any arrogance, they fully support the message of the girl.